Everything was great about this property! Walkable from the train station. Had all the amenities one could want. Wifi was excellent. The view of Matterhorn from the balcony was really cool. The hosts communicated well and answered all our questions very fast. Definitely would recommend to anyone! Fast coordination with owner upon booking confirmation. Easy, hassle-free check-in instructions. Breathtaking views of Zermatt and the Matterhorn! Clean apartment. Complete amenities, perfect for families with children — there are board games, movies available at the property. Easily accessible grocery nearby. Easy to check in and out! Fast responses to questions while I was staying there. So nice and the view was amazing. Very helpful host. Well-equipped kitchen. Everything works. Communication with the owner was easy and fast and most accommodating to our needs. The property was spotless and very well equipped with absolutely everything you needed, and more! The appartment is very comfortable and the views of the Matterhorn are spectacular! We would definitely stay here again and recommend the property to friends! Nice view, you can see the Matterhorn on the balcony. The house is big and comfortable. The house owner is nice and helpful. No extra cleaning fees. Location nice, more private, but a bit uphill for older people. Very spacious and modern, kitchen well stocked with appliances. Very nice and cosy ampartment. Kitchen well equipped. Magnificent view. Property was superb, very spacious, clean and tidy with fantastic views. Die Grösse der Wohnung, die Ausstattung mit perfektem WLAN, Spülmaschine, separate Dusche waren durchweg sehr gut. Lock in a great price for Haus St.Martin – rated 8.9 by recent guests! Haus St.Martin This rating is a reflection of how the property compares to the industry standard when it comes to price, facilities and services available. It's based on a self-evaluation by the property. Use this rating to help choose your stay! One of our best sellers in Zermatt! 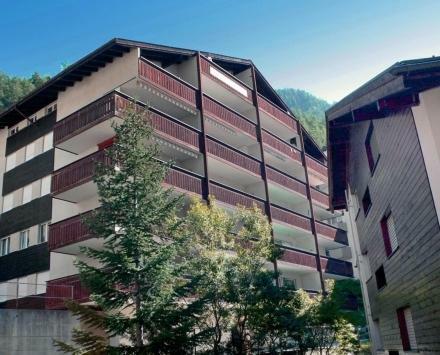 Set on a tranquil panoramic spot 2,300 feet from the vibrant center of Zermatt, Haus St.Martin offers a spacious apartment with a Matterhorn-view balcony and many modern amenities such as a DVD player. The St. Martin apartment consists of a large living room, a fully equipped kitchen and 2 bedrooms. The interiors are decorated in classic mountain style with lots of hand-carved wood. A tiled bathroom features a shower and a bathtub. The final cleaning fees are included in the price. A ski storage room is available in the house. Many shopping, dining and nightlife options are available 2,300 feet away. Sunnegga Cable Car is only a 5-minute walk away. Täsch Golf Course is 3.1 mi away. Zermatt Train Station can be reached within 8 minutes. The house can only be accessed by a set of 70 steps. 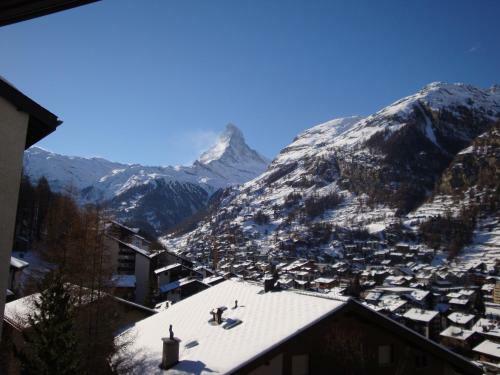 뀐 Located in the top-rated area in Zermatt, this property has an excellent location score of 8.3! When would you like to stay at Haus St.Martin? Apartment consisting of a large living room, a fully equipped kitchen and 2 bedrooms ( 1 with double bed and 1 with bunk beds). The interiors are decorated in classic mountain style with lots of hand-carved wood. A tiled bathroom features a shower and a bathtub. Amenities include cable TV and a DVD player. House Rules Haus St.Martin takes special requests – add in the next step! We had problems locating the building at arrival on late hour (it was dark). We did get instructions, but could be better - more descriptive in terms which stairs to take. Could have done with better instructions for finding the apartment once in haus st martin. Also some instructions for what to do with rubbish and recycling would have been helpful. Apartment is located at the side of mountain. Not good for older aged travellers who cannot go up a lot of flight of stairs. But good for those who want to burn some calories. Located about 500 meters from city center. We were 6 guests. The couch is in a synthetic leather material and very slippery. Sleeping two in it was a challenge, but after using an extra mattress that was available in the apartment, only one had to sleep on the sofa - which worked OK. Nothing bad, just if coming to ski the way up the apartment is a bit icy. Less mobile people should be aware that the appartment is up quite a steep hill and steps and about 15 minutes walk out of town. No problem for us as it's location was lovely and quiet and the higher position made for stunning views of Zermatt and the Matterhorn. The payment method is really complicated and we need to do the international transfer and pay the extra transfer fees. 1. Bed in master bedroom was awful. I switched with my daughter, who is 40 kg lighter, and even she complained about it. 2. No contact with owners. Not even a letter. They could have visited 1 evening to ask if we needed anything. 3. No wifi, common spaces being renovated, cement etc. in the lounge.